A dog left out in the rain is susceptible to diseases and infections. Sure your pet is gifted with fur to keep him warm but that alone is not enough to keep him dry and cozy. Now that it is almost springtime, you must think of ways to safely take your dog out in the rain so he remains warm, dry and safe. 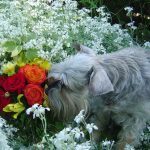 Let us explore some products that can help you and your pet this spring season. 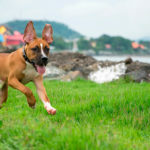 If you and Fido love walking or running every day, then you need to keep certain supplies handy. These supplies can help you continue your routine without having to worry about cold, wet weather. Now you may think that you can take your pet out in the rain without too much protection. After all; haven’t dogs evolved from wolves that lived in the wild? Your dog is naturally blessed with a water proof fur thick coat that can help him withstand most extreme forms of weather. Naturally, you must take your dog’s breed, age, health and other factors into consideration. Certain breeds like hairless Xoloitzcuintli, Chihuahuas and Chinese Crested cannot withstand extreme temperature changes. So you need to dress them warmly and prevent them from getting overheated or very cold. In any case, it is a good idea to invest in good walking gear for your pet if you plan to take him on long hikes. 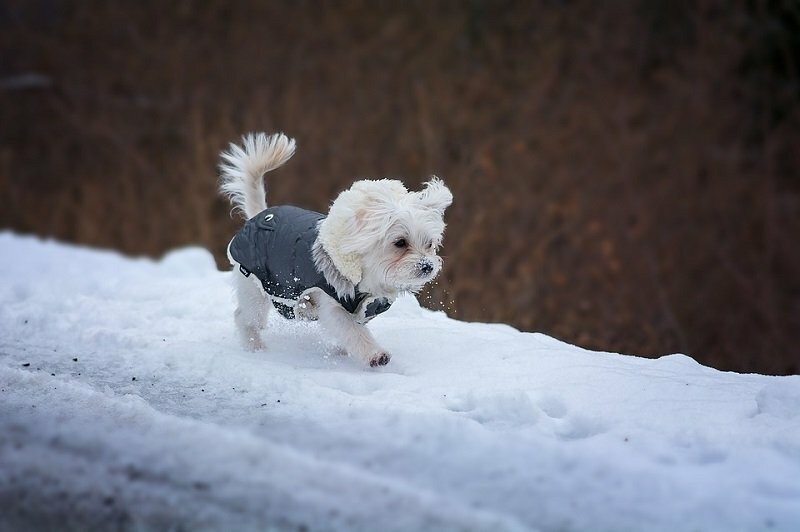 If you are determined to take your dog in the rain or snow, be prepared for heavy duty cleanup once you are back. Depending on where you walk, your pet is likely to bring in wet mud inside your home. It is a good idea to keep a hose handy near the patio so you can wash his paws before entering the house. You can also keep some rags or old cloth to wipe him down before taking him indoors for heavy duty clean up. Don’t forget to place newspapers, old rugs etc outside the door to mop up the dirt. A watering bucket and pail to wash off Toby’s muddy paws before entering the house. Stock up the hallway closet with good walking gear for you and your dog. Ponchos, dog raincoats made from polyester or waterproof materials and other rainwear is readily available for small, medium and large dog breeds. You could also custom design dog ponchos for toy or giant breeds. Do invest in sturdy hiking boots for yourself and a raincoat and umbrella to keep you dry. If you are not too fond of bringing a muddy dog home, you can stick to neighborhood or park paths instead of hiking trails. Dogs tend to pick up twigs, burr, branches, leaves etc when they walk in the woods. So a quick grooming session becomes imperative after you are back from your walk. Do not allow your pet to enter the house until he has been brushed thoroughly. If you have a long haired pet, you can keep a bottle of dry dog shampoo, some dog deodorant or dry conditioner to deodorize your pet. Spray or dust the product and thoroughly brush the coat to remove loose hair, twigs, debris as well as ticks and fleas. You can also keep a hose or plastic watering can to quickly wash his paws before he enters the house. These days, there are excellent dog shoes with anti slid soles and water resistant covers available to keep your pet’s paws clean and dry. Some products even come with reflective fastening straps so motorists can see your pet when you walk along roadside. Use the size chart given for each product so you can buy the right size for your pet. Rugged, waterproof, anti-skid shoes protect your pet’s paws from cold, muddy water, slush, thorns, rocks, allergens, and also from hot pavements and melted asphalt in summers. 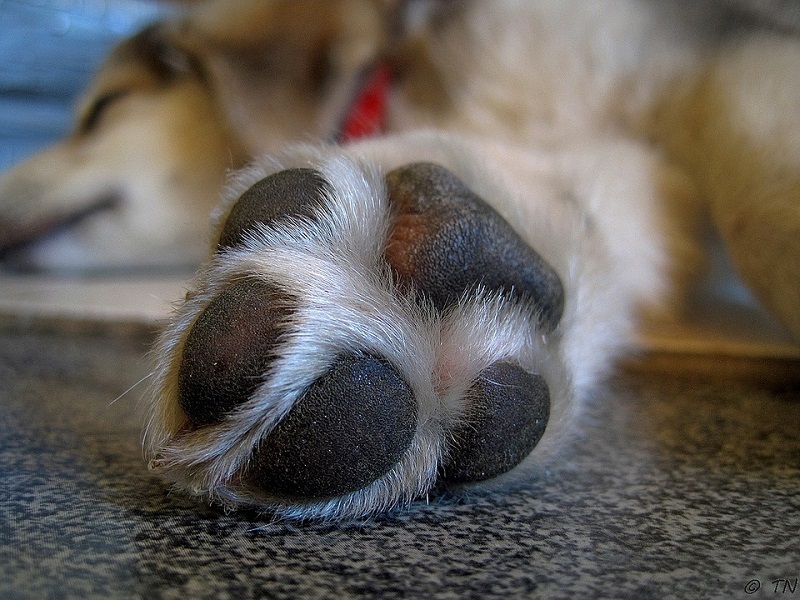 Always ensure the right fit for your pooch else his paws could end up with blisters after walking in them. You can also invest in Pet umbrellas that are attached to the pets’ leash. These usually consist of inverted umbrella covers that completely cover your pet. They come with a walking stick or shaft that can be adjusted to suit you and your pet’s comfort. You can go in for transparent umbrella that allows you to see your pet while you walk. Ideally these umbrellas are suitable for puppies and small dogs. Purchase a coat for him. Ensure snug fit. Dog head muffs can help protect his ears and head from cold. If you live in wet and cold climate, buy a weatherproof rain slicker or rain coat as described above. Some raincoats for dogs have detachable fleece lining. This way, you can provide an extra layer of warmth in cold weather. Measure your dog’s girth (the area around his chest and waist.) You also need to know your dog’s weight in kilograms/pounds. Choose a coat that is slightly bigger than these measurements. Avoid coats that are too small or snug around the waist and arms. 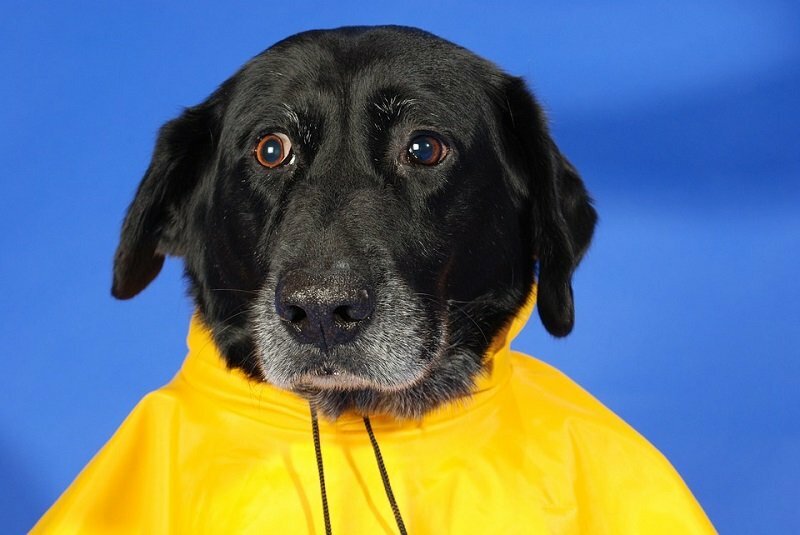 Tight raincoats will not only make your pet uncomfortable; they will also impede his normal movement. It is best to buy a coat from a brick and mortar pet shop. Take your pet with you so you can try the coat on him/her. You can also buy coats offline these days. There are coats available according to breed height and weight standards for small dogs like Dachshunds all the way up to large breeds like the Great Danes. You can select between cold weather coats or rain coats. Give some time for your pet to adjust to the coat. Put it on while he is at home. Allow him to roam about in it. Take him for a short walk around your house. Observe him. Is he comfortable? By watching his movements, you can make adjustments to the coat. You also need shoes for your pooch to protect the paws from chemicals and salts added for deicing pavements. Avoid walking along these tracks and on very cold days, it is best to stay indoors. Chemicals added on roads are not the only danger to your dog. Never allow your pet to lick water or snow near the roadside. Even a small solution of antifreeze can harm your pet. Always carry fresh drinking water with a small bowl when you take your pet out on hikes. This is a lightweight poncho for various sizes and breeds. It has a Velcro waist band and leash hole. RC pet products ponchos are long haired breeds. This stylish and comfortable raincoat will keep your do dry and warm. The Velcro fastenings come on chest and waist. It is lightweight, convenient and washable. You can also pack it easily when you travel. Ethical Pet Fashion has made this raincoat taking into account various dog breed and sizes. This umbrella has a built in leash. It measures about 28.3 inches in diameter and is made with PVE material. If you want to replace complex raincoat, use this umbrella to keep your pooch dry. The umbrella comes with detachable handle, traction chain and spring traction. This healing salve provides a natural barrier on the pet’s paws to prevent them from cold, snow, salts, and chemicals, melting asphalt, allergens and heat. It is completely organic and natural and helps protect pet’s paws from cracking. The roll-on product also heals cracked paws. It is richly made in America with organic ingredients like mango butter, rice bran oil, sunflower wax, essential oils and herbal extracts. You can buy dog boots to protect your pet’s paws from mud, cold and allergens. They are secure, adjustable and available in different colors. Rugged and tough, these shoes will prevent skids and slips. You don’t want your dog to sprain its legs on the snow. Use these boots to ensure your pet is ready for adventure no matter what the weather outside. Dog Skin Allergies - My Dog Has Dry Flaky Skin and Scabs - What Do I Do?